modus were sucessful in winning a bid to develop a smart phone app for our existing client, the University of East London. UEL is a modern, leading sporting university located in the London Borough of Newham, East London. The Uni Finance app is the essential guide to student finance for all current and future university students in the UK. 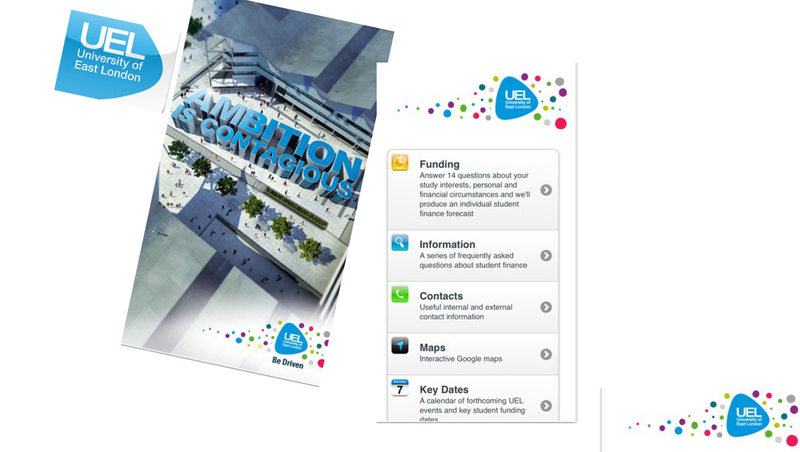 Designed by modus for UEL, it provides information on national sources of funding for students studying at any university in the UK as well as details of the financial support package available to students who choose to study at UEL. The funding calculator is a unique feature which will provide students with a personal student finance plan based on the answers to thirteen multiple choice questions. UK student loans and grants, NHS funding, Benefits, Funding for students with a disability, Providers of scholarships and bursaries, Student finance videos, Budget calculator (also includes funding only available to UEL students).